We talked and I listened. My heart was moved with compassion. 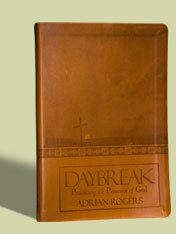 I said, “Let me pray for you.” And when I finished I said, “In Jesus’ name, Adrian Rogers.” And then I thought, “Oh my! Did I say that? Did he hear me say that?” How easy we slip and rattle off our prayers. Do you find yourself using repetitive phrases in your prayer life? Today, just talk with God. Don’t think too much about your words. Follow your heart. Originally published June 02, 2015.